pH (potential of hydrogen) is a figure used to express the acidity or alkalinity of a solution on a logarithmic scale. On this scale 7 is neutral; lower values are more acidic and higher values are more alkaline, with a maximum measurement of 14. In process applications, pH is generally measured with an inline pH probe, the most common being the glass combination electrode. Additionally, an inline pH probe generally requires a process adaption, cable and transmitter. How does a pH probe work? 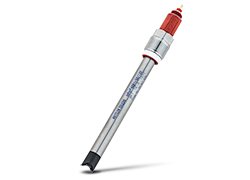 A typical combination pH probe is made up of two separate electrodes built into one, a pH sensing electrode, and a reference electrode. In the simplest terms, a pH sensing electrode uses a special pH sensing glass membrane. H+ ions permeate the membrane creating a charge. The potential between the two electrodes is the measurement of hydrogen ions in the solution, giving the measure of pH. For more details, download the free pH Theory Guide. What is the difference between a pH probe, a pH sensor and a pH electrode? Absolutely nothing! The three terms are used interchangeably in the industry. 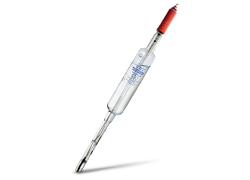 They can be used for probes that are used in-process or in laboratory measurement. You may also hear the term "pH meter". This can be used for a piece of laboratory equipment, or the term pH meter can also be used to mean the combination of an inline pH probe, cable and transmitter. How do I select the right pH probe? For optimal pH measurement it is crucial to choose the right pH probe for each application. The most important criteria are: chemical composition, homogeneity, temperature, process pressure, pH range and container size (length and width restrictions). 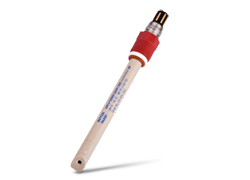 The choice of pH sensor becomes of particular importance for non-aqueous, low conductivity, protein-rich and viscous samples where general purpose glass electrodes are subject to various sources of error. The response time and accuracy of an electrode is dependent on a number of factors. Measurements at extreme pH values and temperatures, or low conductivity may take longer than those of aqueous solutions at room temperature with a neutral pH value. How long does a pH probe last? 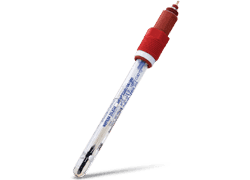 An inline pH probe lasts for varying amounts of time, depending on a variety of factors, including the quality of the pH probe, the media that it is in, the temperature it measures in and how well it is maintained. A well maintained pH probe generally lasts 6 months to 1 year in a routine, moderately clean application. While there are significant variances in the lifetime of pH probes, intelligent, digital sensors with ISM technology use an algorithm to determine the remaining lifetime on your pH sensor. pH probes with ISM technology predict sensor malfunction before it happens and can therefore dramatically reduce downtime. How do I maintain my pH probe? Most pH sensors operate maintenance free, but there are some clear examples of where maintenance is required. For example, in certain applications (such as sugar production) where sensors are in a viscous solution, clogged diaphragms on a pH sensor need to be cleaned. Certain solutions (such as those used in varnish production) can also coat the pH membrane glass, causing a reduction in permeability. Without cleaning in these situations, you will get incorrect readings and reductions in sensor lifetime. Another specific example is pH probes with liquid electrolyte that need the electrolyte to be topped-up when the level becomes close to being lower than the level of the sample solution. This maintenance prevents a reflux of the sample into the probe. The complete reference electrolyte should also be regularly changed, approximately once a month. This ensures that the electrolyte is fresh and that no crystallization occurs due to evaporation from the open filling port during measurement. It is important not to get any bubbles on the inside of the probe, especially near the junction. If this happens the measurements will be unstable. To get rid of any bubbles, gently shake the probe in a vertical motion as with a fever thermometer. How do I clean a pH probe? To clean a pH probe, rinse it with deionized water after each measurement but never wipe it with a tissue. The surface of the paper tissue can scratch and damage the pH-sensitive glass membrane, removing the gel-layer and creating an electrostatic charge on the electrode. This electrostatic charge causes the measured signal to become very unstable. Special cleaning procedures may be necessary after contamination with certain samples. How often should I calibrate and maintain a pH probe? Regular maintenance and calibration of your pH probe are critical. How and how often to calibrate and maintain a pH probe depends on both the probe and the usage. In general, the best way to know when your pH probe needs calibrated or maintained is to use an intelligent pH probe with ISM technology. These pH probes use an algorithm to measure Time to Maintenance and also provide an Adaptive Calibration Timer. How do I store a pH sensor? pH sensors should always be stored in reference electrolyte. This allows immediate use of the pH sensor when needed, and ensures a short response time. When stored dry for long periods, many pH sensors must be reactivated by soaking for several hours before use in order to get the optimal measuring results. If these measures are not sufficient, the electrode may be made functional by treating it with a special reactivation solution followed by subsequent conditioning in the reference electrolyte. Do not store a pH sensor in distilled water, as this will cause the pH sensor to have a longer response time. What is redox potential? What is ORP? Redox is short for reduction-oxidation reaction. It is a chemical reaction that changes the oxidation states of atoms. ORP stands for oxidation-reduction potential. Redox potential and ORP are two ways of saying the same thing. It is a millivolt measurement of the tendency of a chemical substance to oxidize. While the pH value measures the concentration (more precisely, activity) of hydrogen-ions, the ORP value is determined by the electron activity. How does a redox probe work? An ORP probe or redox probe works by measuring the difference between electron activity related to a noble metal like platinum or gold and a reference system that provides a stable potential, like those used in a pH measurement. What is the shelf life of a pH probe or an ORP probe? 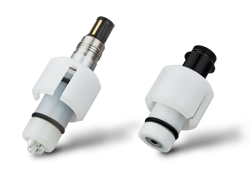 If a pH sensor or ORP sensor is stored at normal room temperature with its original storage cap and solution in place on the end of the electrode, it can last well over a year with no degradation in performance. If the storage solution is allowed to dry or leaks out due to storage at high temperatures, freezing or other causes, the life of the probe may be reduced significantly. What should I look for in a pH probe for pure water applications? pH measurement in pure water requires a pH electrode that ensures a consistent, stable measurement. 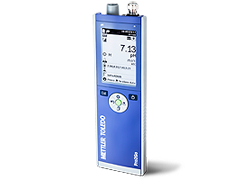 Sensors like METTLER TOLEDO's pHure pH sensor feature a special low-resistance pH glass membrane, shielded flow chamber and a continuous outflow of electrolyte. Features like these and others allow for the stable and accurate measurement of pH and ORP that is required in pure water applications at power plants and microelectronics facilities. In applications where precise measurements are important, refillable pH and ORP probes deliver high accuracy and long lifetimes. Sterilizable, hygienically designed pH and redox (ORP) sensors offering high measurement accuracy in pharmaceutical, biotech and food applications. Specialized, highly durable pH and redox (ORP) probes designed to perform reliably under harsh conditions in chemical applications. Unique pH probes designed for reliable pH measurement in low conductivty, ultrapure and pure waters. ISFET pH probes offer a non-glass solution for industries such as food or biotechnology, where safety and hygienic design are paramount. Easy-to-use, portable pH meters for industrial applications. They offer high measurement accuracy in a robust, weatherproof design. This guide to pH measurement is a must-have reference for people involved in analytical measurement roles that include pH. Written for people in process industries, the pH Theory Guide covers a wide range of theoretical and practical situations in regard to the measurement of pH. In this guide you will read about tools for pH measurement, maintenance of a pH probe, pH probe selection and handling, and much more. This pH calibration guide walks you through the step-by-step process of how to calibrate a pH probe. Find information on the materials you need for extending the life of your pH sensors, and the process for calibrating in the field and in the maintenance shop. This guide is designed to help you ensure you have consistent accuracy in your pH measurements. 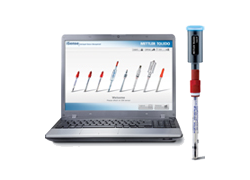 It covers topics related to precision and accuracy of a pH probe, requirements for a highly accurate pH sensor, and influencing factors that can give you errors for your overall pH measurement system. In the Process Analytics Catalog you will find more detailed specifications of many of our most popular models of pH sensors. Included are our probes for measuring the pH of pure water, our pH probes with Intelligent Sensor Management and our ORP probes. Complete your entire pH meter with a transmitter and housing for easy installation. Additionally, you will find sensors and analyzers for a wide range of other analytical parameters that we support. This video shows the fundamentals of how a standard combined pH probe measures. You'll learn the key parts of the pH electrode, and see an overview of how the pH-sensitive membrane glass works in different solutions to measure different pH values. Get an overview of how METTLER TOLEDO makes thousands of InPro pH sensors per year in our factory in Urdorf, Switzerland. See how competence, precision and quality are critical to hand-crafting each of our glass pH electrodes. Learn the benefits of digital pH probes in the process industries. This example in the pharmaceutical industry demonstrates the benefits of pre-calibrated digital sensors with ISM technology. Shifting to digital sensors can help achieve greater process reliability, easier pH sensor handling and can simplify your compliance processes.